Beta Carotene is a healthy skin ingredient in both our diet and in a good daily skin care regimen for every type of skin. It enhances sunscreen protection, accelerates cellular metabolism, strengthens the immune system and due to its rich antioxidant function, it fights free radicals effectively. Before finding out more about Beta Carotene benefits for skin and face, let´s talk about what Beta Carotene is, what foods contain beta carotene and how we can benefit our skin by using skin care products that contain Beta Carotene. Beta Carotene is a fat-soluble antioxidant vitamin and a natural dyeing essence that is responsible for the intensely bright orange/yellowish color that many fruits and vegetables have. In addition, it is the most powerful precursor of vitamin A. Once it is consumed, it gets converted (mainly in the intestine and liver) to vitamin A which is well known for its beneficial properties for the body´s health as well as the skin´s. What Natural Foods Contain Beta Carotene? Beta Carotene is mainly found in fruits and vegetables that have a yellow, orange and dark green color. Valuable sources of it are sweet potatoes, melons, apricots, mango, pumpkin, grapefruit, onions, spinach, peppers, asparagus, broccoli as well as prunes. What Does Beta Carotene Do for your Skin? Beta-carotene is first of all a powerful antioxidant and therefore it has the power to bind or neutralize free radicals. Free radicals are unstable oxygen molecules that in order to stabilize, they attack neighboring cells, disrupt and oxidize them, leading them to premature death, which in our eyes appears as premature skin aging. You can benefit from the antioxidants´ function by eating foods that are rich in them and also using skin care products that contain antioxidants. As a powerful antioxidant, Beta Carotene protects the skin cells from oxidative stress and helps to repair their damage. As we have already said, B Carotene is considered to be the most active precursor of Vitamin A. Thanks to its ability to convert to retinol in the body -the active form of vitamin A- it offers the skin the multi-beneficial effects of the ingredient which over the years has been one of the most powerful anti-aging ingredients of cosmetology. It therefore stimulates the natural cellular metabolism and activates microcirculation, boosting the production of collagen and elastin and enhancing the immune system. As a powerful antioxidant, beta-carotene helps the skin to cope with the attacks of the free radicals to the cells, including those that are produced by exposure to UV radiation. What beta-carotene really does is to make the skin more resistant to the harmful effects of ultraviolet radiation. This is one of the reasons why Beta Carotene is specially recommended for sensitive types of skin and fair skin tones. Due to its rich antioxidant properties, b carotene works as an anti-inflammatory component. That is why it can help with a number of inflammatory skin issues such as rosacea, psoriasis and eczema. Undoubtedly, a diet that is rich in beta-carotene is a first and important step to take for the good health of your body and, of course, your skin. The next step is to benefit the skin even more by using skin care products that contain beta carotene. By topically applying to our face, body or eyes products that contain natural or synthetic beta-carotene, we accelerate cellular metabolism, strengthen the protective barrier of the skin, visibly improve the tone of our skin and boost the skin protection against the sun as well as its antioxidant protection, thus delaying the appearance of aging signs. 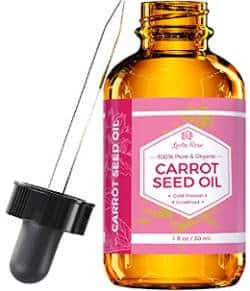 This natural carrot seed oil is rich in natural beta carotene and other powerful antioxidants such as vitamin E. The company suggests that it is great for mature as well as dry types of skin but also for brittle and damaged hair. 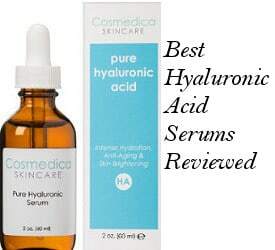 Users review that it is great for anti-aging skin care to reduce fine lines and wrinkles, protect from the sun, moisturize dry skin and repair skin damages such as sun spots, hyperpigmentation, etc. It also heals scars and works as a natural sun blocker. It does not clog pores or cause breakouts and people have reported positive results when it comes to helping with rosacea, psoriasis and acne marks. A little goes a long way and the price is great, too. Pai Rosehip Oil is a wonderful natural oil that has been one of my staples for several years now. It contains high levels of carotenoids and this can be attested by its deep orange colour. It is certified organic and described by the company as the most concentrated rosehip oil on the market today since it combines both rosehip oil from the seeds and rosehip oil from the fruit. This is a top quality product for healing scars, fine lines and sun damage. 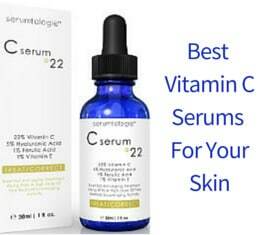 The benefits I have personally been experiencing is a nourished skin that is more resistant to aging. 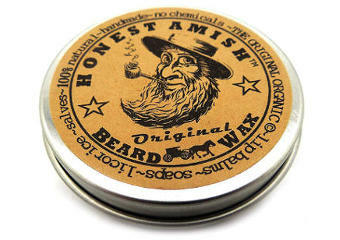 It also helps with clearing skin from blemishes and promoting its glow, healthy appearance and smoothness. 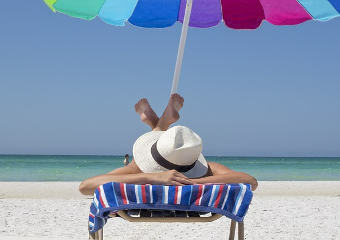 Does Beta Carotene Help You Tan? If it is taken in high doses -through dietary supplements- it can give an orange tint to the skin, mainly on the legs, palms of the hands and on the nose, which makes us think that we look tanned. But once we limit the dosage, the tint immediately subsides. Depending on the amount of Beta Carotene in skin care products, it can help tanning especially in fair skin tone complexions. For example, carrot seed oil is said to boost tanning according to some users´ reviews. In conclusion, Beta Carotene benefits for skin and face make it an excellent antioxidant ingredient not only for your skin care routine but your daily diet as well due to the general health benefits it has.